These chocolate pistachio biscotti are super delicious, easy to make and look good with the pieces of emerald green pistachios shining out. I’ve made them gluten free. Gluten isn’t an issue for me, but it’s really useful to have a few recipes up my sleeve for when I do need to bake something for someone who has an intolerance or has coeliac disease. Vicky at the Free From Fairy has come up with her own gluten free flour mix which is now available for sale on Amazon and at various outlets that you can find here. I’ve been following Vicky, who’s a fellow South West food blogger for a few years now. I was particularly excited to try some as the mix is a wholegrain one. Vicky’s daughter has coeliac disease. Not content with the standard gluten free flours that were out there, Vicky has been using a mix of ancient grains that are actively good for you. Teff contains calcium, protein and resistant starch that helps to control blood-sugar levels. Sorghum is high in fibre, iron and protein and is also rich in antioxidants. Buckwheat is a flour I use regularly and it has high levels of vitamins, soluble fibre and proteins. Gluten free flour is known for being a bit tricksy, but I’m sort of used to that as I’ve been cooking with wholemeal flour all my teenage and adult life. In the absence of gluten, Xanthan gum is often used to “bind” the ingredients together. I didn’t have any of that to hand, so I went ahead anyway. The resulting bake has a slight tendency to crumble, but mostly holds together very well. It’s important to leave the biscotti to cool for at least 15 minutes after the first bake before attempting to cut it. Use a serrated bread knife to gently saw into slices and any bits that do crumble away are the cook’s perks. If gluten isn’t an issue, you can use wholemeal spelt instead. I like my biscotti to have a little give in it. I know you’re meant to dunk them into a hot drink to soften them, but I don’t like to take chances with my teeth. If you like them slightly soft, then reduce the 2nd bake by 5 minutes and if you like them hard bake for a further 5 minutes. Even though my chocolate pistachio biscotti are now cool and have been packed away, the house is still delightfully scented with orange, cardamom and hot chocolate. It’s the smell of Christmas. A classic Italian twice baked biscotti studded with pistachios and flavoured with chocolate, orange and cardamom. Perfect for dunking. Whisk together the flour, cocoa, baking powder, salt and sugar together in a large bowl until thoroughly combined. Finely grate the orange zest and add that together with the nuts and chocolate. Stir and make a well in the centre. Break in the eggs and add the juice of half the orange. With a flat bladed knife, stir from the inside out until everything's combined. If the mixture is too dry, add a little more orange juice. Bring the dough together with your hands. Divide into two and roll into logs about 4 cm in diameter. Place well apart on a lined or greased baking sheet and bake at 175℃ for twenty minutes or until golden. Remove from the oven and allow to cool for at least 20 minutes. Using a bread knife or other serrated knife cut the logs on the diagonal into 1 cm slices. Arrange the slices back on the baking sheet and bake at 150℃ for about 15 minutes depending on how crisp you like them. 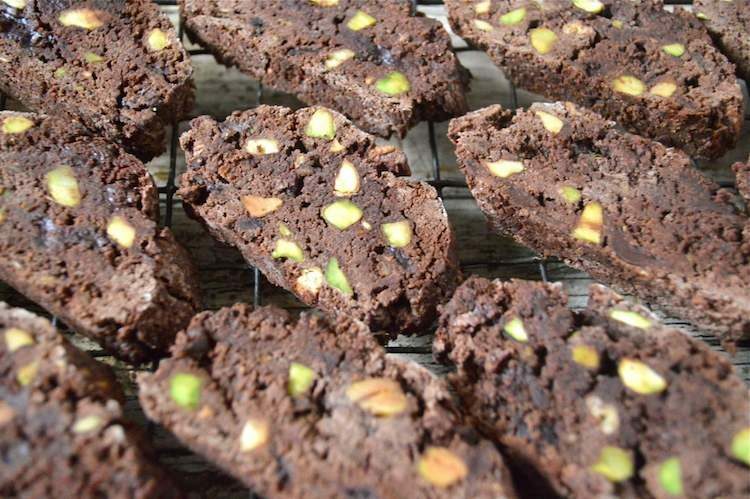 These chocolate pistachio biscotti are my We Should Cocoa entry this month. If you have any recipes using chocolate this December, do please join in. I’m also sending my Christmas biscuits off to Treat Petite at The Baking Explorer and Cakeyboi. Thanks for visiting Tin and Thyme. If you make these chocolate pistachio biscotti, I’d love to hear about it in the comments below or via social media. Do share photos on social media too and use the hashtag #tinandthyme, so I can spot them. For more delicious and nutritious recipes, follow me on Twitter, Facebook, Instagram or Pinterest. Wonderful recipe. Nothing can go wrong with this flavour combination I think. Pistachio’s are horribly expensive these days, but fortunately we have Christmas as an excuse to buy some luxury ingredients, haven’t we ? Besides, these biscotti wouldn’t look half as nice without them. Thanks Galina. They certainly need a hot drink to accompany them. Oh my gosh! These look incredible. I think I can smell them in Devon! Or is that wishful thinking? I am certainly going to have to make these…what a fabulous recipe. And if any of your readers want to get hold of my flour they can either buy it on Amazon or check out my stockist page on my website freefromfairy dot com. I have a few stockists in Cornwall now! Happy Christmas and thanks for sharing such a wonderful recipe! Thanks very much Vicki. I love your flour. I’ll update my post now so people know where to get it and well done for getting at Archie Brown’s and at River Cottage. Oh, I bet that was fun. I’ve never made a gingerbread house. I bet your house smelt gorgeous. Oooh this sounds yummy! I’ve always thought biscotti must be a bit of a faff, since you have to bake it twice, but actually you’ve made this sound really easy! Wow, your biscotti look divine! I have never made them but a chocolate version with orange has my name all over it. I think the gluten free flour making it more crumbly is a good thing as they can be so hard! Wonderful! I love the colour contrast of dark choco and green nuts and of course the flavour too! I LOVE biscotti. There’s something so festive about it. Your flavour combinations sound great, I usually make a gingerbread version for Christmas. Now that’s a lovely idea Claire. I’ve never had gingerbread biscotti before. Ooh, I love cardamom and chocolate together. And chocolate and orange. What’s not to love about this recipe? Oh yes!!! Choc orange. My fave ever combo. Plus cardamom. So chic! Hi Choclette, cardamom is so good in baked goods, I bet these are delicious! O I love biscotti! (and chocolate!) But the orange and cardamom are such unique additions! What amazing biscotti you have created Choclette. They sound delicious and look so beautiful. Pistachio always looks and tastes so vibrant against chocolate. You’ve got to have a few pistachios at Christmas. I love their jewelled green. Have you tried Vicky’s flour? I really like it. What a superb bake to receive at Christmas! And the gluten free flour mix certainly makes things easier when catering for coeliac friends. Thank you for linking up to Treat Petite!